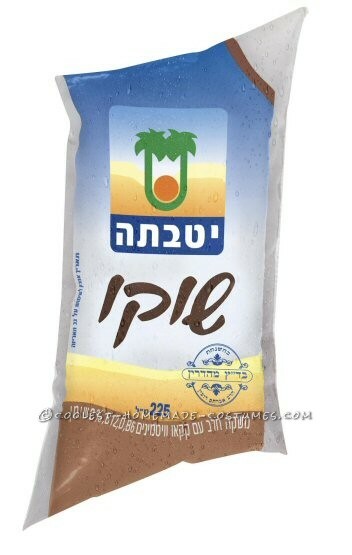 In Israel, a favorite kid’s snack is chocolate milk in a bag. They tear off the corner with their teeth and drink. 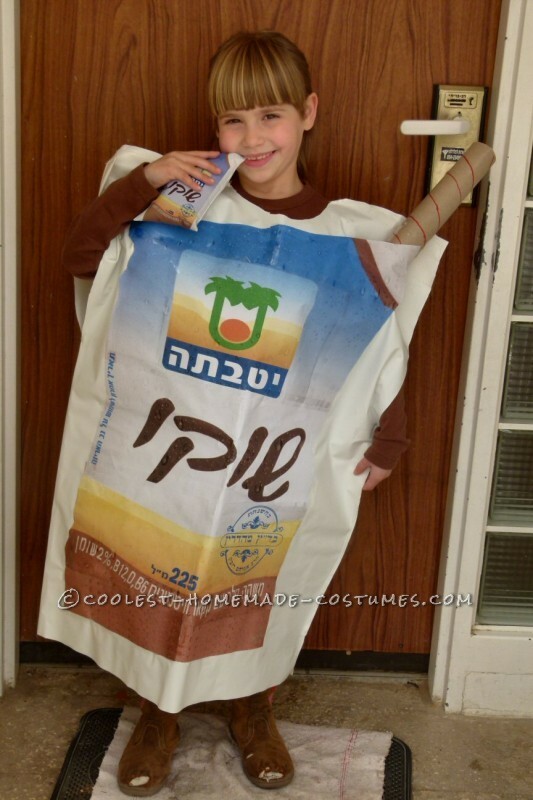 I don’t think this ‘sophisticated’ concept has reached most other countries, but you could use this basic idea to make a juice drink costume, potato chip costume, or any other product that comes in a bag. The main costume material is a plastic white tablecloth. It could also be made from the white plastic under-sheets that you buy for kids who are potty training at night. I cut two equal-sized pieces, cut a neck hole (had to measure a few times with my daughter’s head to get the right size semi-circle) and then sewed the top and sides closed, except where the neck and arm holes needed to be. 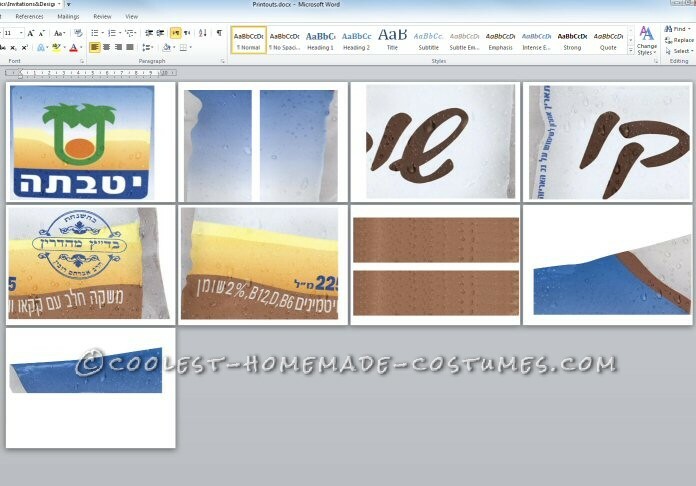 I found a good resolution image of the product label from Google pictures (in this case Yotvata Chocolate Milk) and then divided the image into 10 pieces (2X5). I pasted each of the 10 pieces onto a separate page in a Word document and then resized it to fill the page (making sure that the height of left and right halves image on each page were exactly the same so they would fit together when I printed them). We printed the pages, layed them out on top of the bag and were happy to see that they did in fact fit together perfectly and from a distance, you couldn’t see the edges at all. Then we just cut around the edges of the image and pasted on the bag. My 8 year old was happy to help with the cutting and gluing, and that helped her feel like she had an important part in making the costume. We used the same image for the front and back, although we debated doing a proper back of the package (with nutrition info and other texts), but that seemed like it wouldn’t be as nice from a distance. For a bit of extra fun, we took a paper-towel roll, drew a few stripes on it to make it look like a straw and added it to the corner. 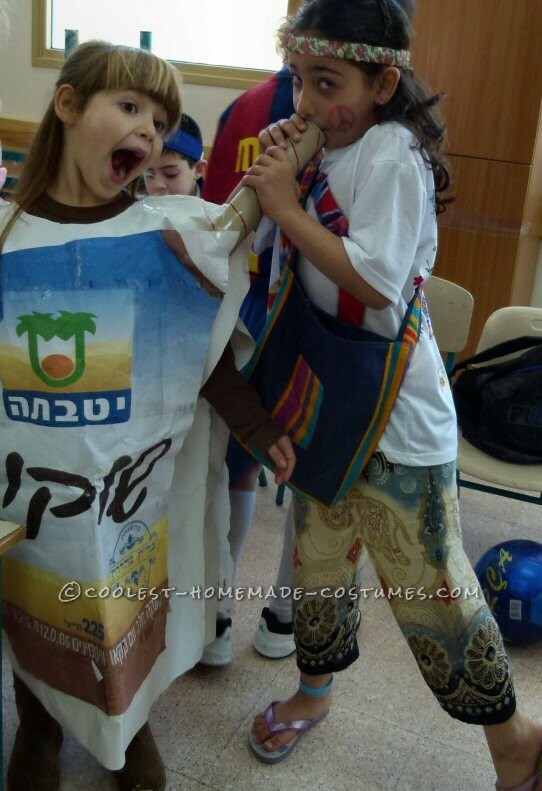 When she wore the costume to school, her friends really had fun taking sips from her. We made sure she wore a brown shirt and brown boots since she was supposed to be chocolate milk, and we gave her an empty package of the actual chocolate milk product (blew it up with air and closed with tape to look new) to carry with her to show off what a good reproduction we had made. Very cool costume, Jackie. Thanks for sharing. 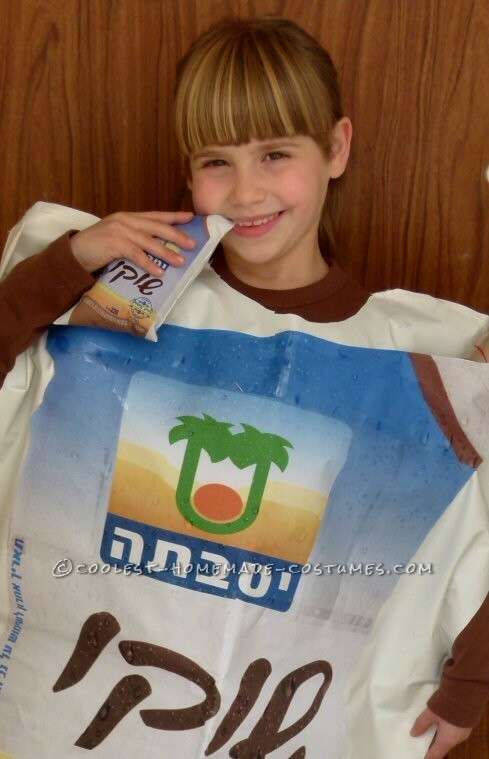 My daughter also wants to be a chocolate milk bag! You just glued the printed paper on? It didn’t rip or peel off?